● Coordinate the project and provide optimal orientation to all partners through a quick set-up of effective management & communication structures, guidance and support. ● Ensure the timely and qualitative achievement of project results through scientific and administrative coordination. ● Provide all planned and necessary reports to EC and ensure a transparency communication with the PO. ● Decide on necessary evolutions with respect to milestones. ● To manage IPR and report on exploitation activities. ● Establish state of the art for each application fields covered by AMITIE, and precise future trends for coming years, as well as expectations with regards to development of AM: complexity of parts, multimaterials, multiscale control of architecture/microstructure, dimensioning, post-treatment, properties, CAPEX, OPEX, etc.). ● Define the needs in terms of materials and process capability. Led by Imperial College London (IC), WP3 aims at developing the feedstocks necessary to implement the various ceramic AM methods of WP4. 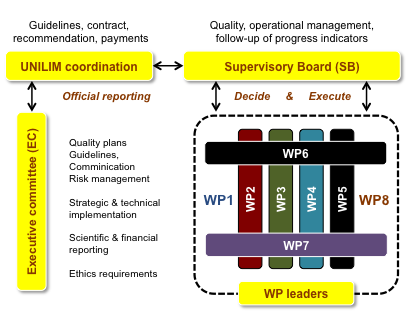 WP3 involves essentially the academics but it is de facto strongly connected to the technological developments performed in WP4 by the industrials. Indeed, the feedstocks have to obey specifications given by AM machine manufacturers. The feedstocks include specialty powders and precursors, aerosols, pastes, inks and ceramic slurries. WP4 is led by HC-STARCK. The focus here is done on the development of indirect (stereolithography, robocasting, etc.) and direct (IJP, aerosol deposition, etc.) AM methodologies. Another important objective of WP4 is the development of hybridized AM technologies (and/or hybridization with subtractive methods) to be capable to fabricate complex multimaterial parts with a control of the architectures and microstructures at all scales. WP5 is leb by the Belgian Ceramic Research Center (BCRC). To obey the specifications (see WP2), it is necessary to apply post-treatments after shaping by AM to give to the parts their mechanical integrity, right dimension and surface state. Sintering is the first concern. Other treatments of interest are CNC machining, robotic polishing and laser ablation. Such treatments are tested on raw parts before sintering and after sintering as well. They are developed in a logic of hybridization with AM technologies (WP 4) in the medium term. WP6 is led by the Polytechnical University of Torino (POLITO). Properties must be characterized at length scales that are fully representative of the architectures and microstructures. Basic consolidation properties (structural and mechanical properties) are then linked to the architectures and microstructures through fine analyses (SEM, TEM, tomography, etc.) and modelling (FEM/DEM, etc.). Functional properties are also investigated (biological properties, RF, etc., depending on the application field considered). 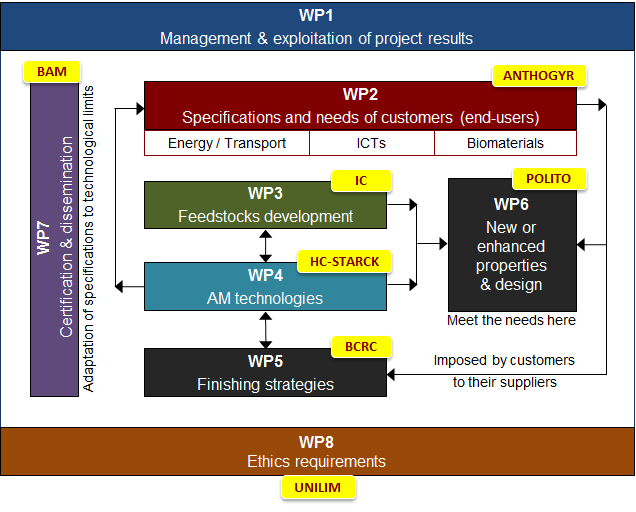 WP8 led by the University of Limoges (UNILIM) sets out the Ethics Requirements that the project must comply with.